CMS will overhaul Meaningful Use and the Quality Payment Program’s Advancing Care Information Performance Category (which got a round of applause from the audience) to help reduce clinician burden and burnout. Privacy and security will be at the center of the intiative’s efforts. Ensuring security will be required to avoid penalties and receive incentive payments. Blue Button 2.0 is in the works to give patients easier access to their digital data. 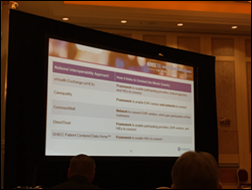 Payers will be strongly encouraged to ensure their members have access to digital claims data. Given the recent HIStalk reader back-and-forth over CommonWell, it’s lack of market penetration (a founding company left and a friend in the HIE space tells me it’s expensive to become a member), and upcoming partnership with Carequality, I thought it might be a good idea to attend the afternoon session on how HIEs, CommonWell, and Carequality can work together. 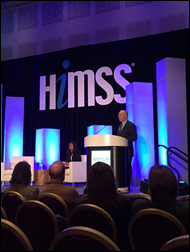 Led by Indiana Health Information Exchange executives John Kansky and Keith Kelley, it followed Mr. H’s rule of only attending HIMSS sessions with zero vendor presence. The hour-long presentation did a good job of bringing me up to speed on the important role HIEs play in making nationwide interoperability happen (some day), and the challenges they face when it comes to selecting their method of doing so based on the needs of their regional members. As one would expect, there’s no silver bullet; HIEs will ultimately need to leverage a combination of CommonWell, Carequality, the Strategic Health Information Exchange Collaborative’s Patient-Centered Data Home model, and the Trusted Exchange Framework and Common Agreement, which is still in draft form awaiting comments. My favorite part of the presentation came during the Q&A, when an audience member – presumably a vendor – asked if blockchain has any role in the HIE/interoperability conversation. The presenters didn’t mince words with their negative reaction, pointing out that FHIR, which the industry has been talking about for the last four or five years, is only just now being piloted by various organizations across the country. Not one person in the several-hundred member audience raised their hand when Kansky asked if anyone was using blockchain, and just one – from Humana – admitted that their organization was contemplating it. The interoperability theme continued during my last session of the day, a fireside chat between HIMSS North American Board Chair and Executive Director of the Georgia Health Information Network Denise Hines and National Coordinator Don Rucker, MD. As one would expect, the conversation was fairly high level and I frankly had a hard time paying attention given what I assumed was noisy casino activity on the other side of the wall. Topics ranged from ONC’s renewed dedication to open APIs and the evolving smartphone revolution in healthcare, patient-centered care, and the need to eliminate info-blocking to move interoperability along. Rucker also addressed some of the 250 comments ONC has received on TEFCA, which should be finalized in late spring. Top of mind on the comment pile are the issues of consent, how the framework will address differing state regulations, and what coordinating entity or collaborative will be put together to oversee it. All that talk of frameworks, APIs, and info-blocking had me in need of some Vegas frivolity, so I stopped by Pivot Point Consulting’s party for a quick sec to enjoy some time with Elvis and the Rat Pack. 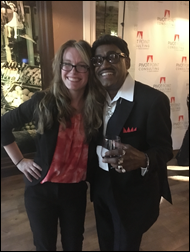 Where else but HIMSS can one sidle up to Sammy Davis, Jr.? More to come tomorrow.